About Heavenly Hues Products — Just Heavenly! No matter your age, if you want a healthy glow to your skin without preservatives, oils, wax, and other additives that can cause skin irritations, . . . . then Heavenly Hues mineral makeup is for you! Three generations of my family are pictured above: Rebekah—mid 20s; Jennifer (me) —low 50s; Anna—low 80s, to show how Heavenly Scents mineral makeup can enhance your features and make you look your best whatever your age. Because our mineral makeup is natural and contains no preservatives it is the perfect solution to foundation dilemmas for those with sensitive and acne-prone skin. Zinc Oxide, known for its phenomenal healing properties, naturally possesses anti-inflammatory, anti-septic, and anti-microbial properties which are extremely beneficial to all skin types, especially sensitive skin. But, the good news does not stop there! Both Zinc Oxide and Titanium Dioxide in our Heavenly Hues foundation formula have the added benefit of naturally protecting the skin from ultraviolet rays. lasts a long time . . . a little goes a long way! coverage lasts 24 hours or more! Our Heavenly Hues line has a new Facial Cleansing Oil that is jam-packed full of natural ingredients that benefit your skin. Avocado Oil: leaves your skin hydrated and softened, AND is an effective treatment for acne and blackheads, eczema, and a variety of skin inflammations. Olive Oil: moisturizes the skin by deep penetration—and it doesn't even clog the pores. The best part?. . . t cleanses gently and naturally. Witch Hazel: Though it may sound medieval it is also a strong antioxidant and astringent with properties that kill off bacteria that live in your skin’s pores. Witch Hazel also is known to stop cellular damage that can lead to skin cancer. Want more good news? It naturally cleanses and tones your skin, shrinks pores and decreases signs of aging! (My new best friend . . . ). Castor Oil: has essential fatty acids that help in restoring the skin's natural moisture balance. Lavender Essential Oil: is a natural disinfectant for the skin. Besides that wonderful attribute it enhances blood circulation and treats various skin maladies such as acne, wrinkles, psoriasis, and other inflammations. Peppermint Essential Oil: is not only an antiseptic and antimicrobial, but it cools the skin and feels wonderfully tingly. Peppermint oil can also aid in oil secretion in the skin, preventing acne. Order on our Heavenly Hues "Face" page. It's right there along with our Foundations, Finishing Powders, and Concealers. Take me there! Your face is a window to the world of who you are and how you feel. You smile, you cry—all the emotions that go with life are all depicted on the face. Since we're only given one face it's important that we give it the proper care it needs. Now, Heavenly Hues mineral makeup will give you confidence in knowing that you look your best. You will know that your coverage is doing its job. The new you is just a click away! 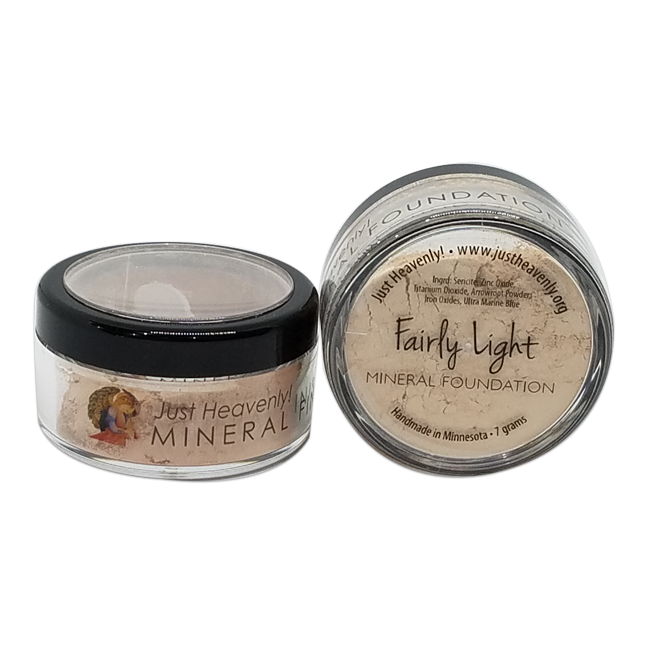 All mineral makeup comes packaged in 30 gm jar with 6.5 grams of mineral foundation. The foundation comes with a sifter lid which allows you to sift into the container lid a small amount to be used in application, so—not only does it prevent waste, but it also prevents a mess. Note: your makeup brush and how you apply your makeup is critical for creating the best look. See the Application Tips for directions on how to give your skin a flawless complexion. You can also find brushes for application at outstanding prices. Ingredients: Sericite, Zinc, Titanium Dioxide, Arrowroot Powder, and Colorant Oxides. Use Heavenly Hues concealer to cover any imperfection on your face before you apply your foundation. Concealer assists in covering blemishes, scars, or rosacea redness. When choosing a shade it is always best to use a concealer that is a shade lighter than your foundation. Our mineral concealer comes packaged in 20 gm jars with 3 grams of concealer. Your concealer comes with a sifter lid—like the foundation—which allows you to sift into the container lid a small amount to be used in application. Note: apply your concealer with a nylon concealer brush—which is easy to use, blends well, and doesn't irritate the delicate tissue around the eye. See our Brushes page . . . Heavenly Hues offers a quality concealer brush at a discount price! Heavenly Hues' Finishing Powder puts an "airbrushed" look to your applied minerals. It helps to diffuse light so that imperfections are minimized and shine disappears. Finishing Powder comes packaged in 30 gm jar with 6.5 grams of product. Use your Kabuki brush should be used when applying your finishing powder. Use the same buffing method you use when you apply your foundation. See Application Tips for further instructions if needed. Note: Finishing Powder comes packaged in 30 gm jar with 6.5 grams of product. Though it is packaged with the same weight as the foundation the consistency is finer, making it appear to be less. This product also comes with a sifter lid, making application easier and less wasteful. Ingredients: Arrowroot Powder, Titanium Dioxide, Zinc, and Colorant Oxides. Rebekah is wearing Medium Foundation and Peach blush. Not only are mineral foundations good for your skin, it is important to note that mineral powder blushes are more flawless and fool-proof than other types. Cream and gel blushes are known to cause splotchy, uneven colorations, they leave a residual stain on the fingers and face—and can even cause blemishes. So, . . . Which blush is right for you? Here's how you find out: first determine whether you have cool or warm undertones. For the most part, fair-skinned people who burn but rarely tan have cool undertones. Cool under-toned people look more pink than peachy. Warm undertones are present in people who can tan rather easily, dark brown skins with "red" tones, and those whose skin is often described as "bronze" or "brown" when tanned. Another way you can tell is looking at the veins in your wrist . . . do yours look blue-toned or green-toned? Blue is cool, green is warm. Orchid — don't let this photo fool you! This shimmer blush looks great on all skin types! Berry— a brand new matte blush that, like Orchid, both skin types can wear! Soft Rose — this matte blush adds a 'barely there' soft glow, and like Russet is a neutral—making it work well for both cool and warm toned skin. Peach — for the delicate fair skin, peach is gorgeous! All Heavenly Hues eyeshadow comes in 5 gram jars with 1 to 1.5 grams of minerals. See our creative combinations photos below for ideas on how to create the best look for you! Spanish Moss dry on the outer crease, and wet as a liner, and Dark Forest used dry on the crease, and wet as a liner. Use Blue Frost on the lid and the inner lid, Liberty on the lid or crease, Periwinkle on the lid, Pewter dry on the crease and wet as a liner, Hot Coal dry on the crease and wet as a liner, Midnight as a liner. Use Lilac Pearl as a highlighter under the brow or your inner eyelid, Pomp & Circumstance on the lid, Eminence on the crease, and use Plum dry as a crease or wet as a liner. Cotton Candy is a brand new (2019) shade that works well with eminence and plum. Use Aleutian Mink on the lid or inner lid, Golden Chestnut on the lid, Copper Mine as a crease, French Silk dry on the crease or wet as a liner, Suede on the lid, Sahara on the lid, Opulent Umber dry on the brow and crease or wet as a liner, Seal dry on the outer lid crease, and Coffee Bean wet as a liner. Use Regal on the lid, Sultan on the lid, Midas Touch on the lid and crease, and Aurelian on the crease. Rebekah is wearing Apricot Glow, Bliss, Rosé, and Garnet. Use Apricot Glow as a highlighter under the brow and the inner lid, Bliss on the lid, Rosé on the inner crease, Garnet on the outer crease, Skinny Dip on the lid, as a highlighter under the brow and the inner eye, and Prestige on the outer crease. Use Ivory Shimmer (a high shimmer) or Chamois (matte) as a highlighter to use directly under your brow and inner lid, London Fog (matte) on the lid is a great blend color with a darker crease shade, Charcoal, our new 2019 shade has a slight shimmer and works well as a liner (when using a wet angled definer brush) that’s not so “in your face” but rather more smoky. and Black Magic (some shimmer) dry in the outer crease and wet as a liner. Witch Hazel: Though it may soundmedieval it is also a strong antioxidant and astringent with properties that kill off bacteria that live in your skin’s pores. Witch Hazel also is known to stop cellular damage that can lead to skin cancer. Want more good news? It naturally cleanses and tones your skin, shrinks pores and decreases signs of aging! (My new best friend . . . ). Our natural lipstick is sure to help keep your lips from cracking because of the good-for-you oils. No gluten in THESE organic lipsticks! And NO toxic additives! Our ingredients are natural and simple: Beeswax, Coconut Oil, Palm Kernel Oil, Butter EZ, Kokum Butter, Jojoba Oil, Castor Oil, and Pigment (Mica and/or Oxides). There are 7 shades for starters, but more to come! Natural Lip Gloss is here! Perfect alone or over your lipstick to give extra moisture. Peppermint Essential Oil is added for lovely tingling freshness. The ingredients in this product match over-the-top expensive brands—excepting for their micas—which are not so natural! See "secret ingredients" cosmetic companies use that you should avoid (listed above). What's nice about lip gloss? You get wonderful hydration with a tinted, semi-transparent gloss. Our nail polish is not only elegant, but is also "10-Free", meaning that no Formaldehyde, toluene, DBP, camphor, formaldehyde resin, xylene, ethyl tosylamide, parabens, phthalates, or fragrance is used . Each bottle holds approximately 15 mL (.5 fl oz). For best results apply two coats of polish on (wait 5 minutes between coats), then apply a clear top coat or clear gel. New hues will be added to our inventory continually, so keep a look out!